Admiral Powercats build an innovative range of Powercats for the leisure, sport, commercial and para-military markets from Cape Town, South Africa From the unique and very successful 21ft Centre Console to the mighty impressive 45ft Express Powercat, each power cat is created with an expertise and quality that is synonymous with Admiral the world over. Admiral Powercats are leagues ahead in design, with a fuel efficiency that most boat-owners would envy. With their asymmetrical hulls, foil-assist technology using hydrofoils and unique chine design, giving the most fuel efficient, safe and comfortable ride available. Web Site Snapshot: If available, above is a snapshot of the Admiral Powercats web site at http://www.admiralpowercats.com as it appeared when this site was added to the directory or last verified. Please Note that Boat Design Net has no involvement with the above web site; all content and images depicted in the above thumbnail are the property and copyright of Admiral Powercats unless otherwise noted on that site. 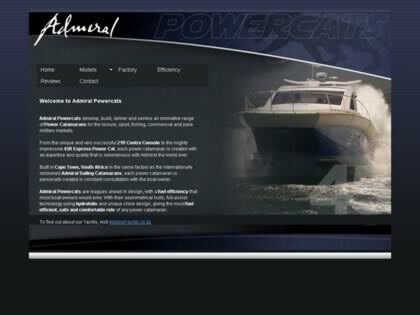 Description: Admiral Powercats build an innovative range of Powercats for the leisure, sport, commercial and para-military markets from Cape Town, South Africa From the unique and very successful 21ft Centre Console to the mighty impressive 45ft Express Powercat, each power cat is created with an expertise and quality that is synonymous with Admiral the world over. Admiral Powercats are leagues ahead in design, with a fuel efficiency that most boat-owners would envy. With their asymmetrical hulls, foil-assist technology using hydrofoils and unique chine design, giving the most fuel efficient, safe and comfortable ride available.